To talk about all the New moon merchandise, applications, etc. I can actually buy a NM wall calender and pay Canadian dollars for it, and not have to order it from the States. I really haven't seen much merch for this movie hit stores yet. A lot of what I've seen it still on the Twilight colouring for the pictures, and I haven't seen much else. I am looking forward to buying an Edward bookmark, and as of right now, that's the only thing on my to buy list (well, that and a Team Edward bracelet set if there are any this time around). By the way, is there any merchandise that you don't quite like or kind makes you wonder? For example, for me it was the body glitter at Hot Topic that they had for Twilight. I never really got it. Then sometimes I will find really cool stuff but other times I'm just left there wondering. 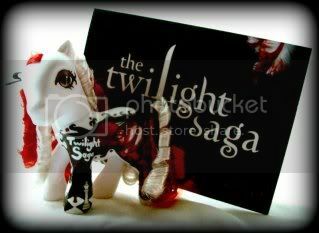 New Moon merch is way more expensive i think than Twilight was Still buy it! Whilst at the local supermarket my boyfriend went past the magazine stands and saw this week's edition of UK Heat Magazine which has a 17 page New Moon special in it (!!) which made him think of me so he brought it for me Means im sitting there quiet whilst he is on the computer haha. Yeah, there was this autograph session and Q&A I went to yesterday and they were selling some New Moon things, and one of them was a pair of socks there for $15 I think, and one of the calenders were going to $20 and people were buying these things, and I was just surprised at that since it was only the day before that I was at WalMart and they had the same calender for like half the price. There is a kiosk at W.E.M that is saying that it sells Twilight merchandise, but I haven't had a chance to see if they had any from this movie. More NECA merchandise on Amazon: the Edward Mason ring the headline says "Pre-Vampire" ring... so? maybe it shows up in one of the flashbacks? i think it would be weird if he suddenly had a new "old" ring in the 2 movie, when it was not showed or mentioned in the first one.. The only way i can se it being "justified" is if he suddenly finds it after having lost it, or that he only wears it in a flashback or someting... what do you think?